Officially, Mercedes-Benz remained retired from racing; the disaster at Le Mans still weighed on everybody’s minds. 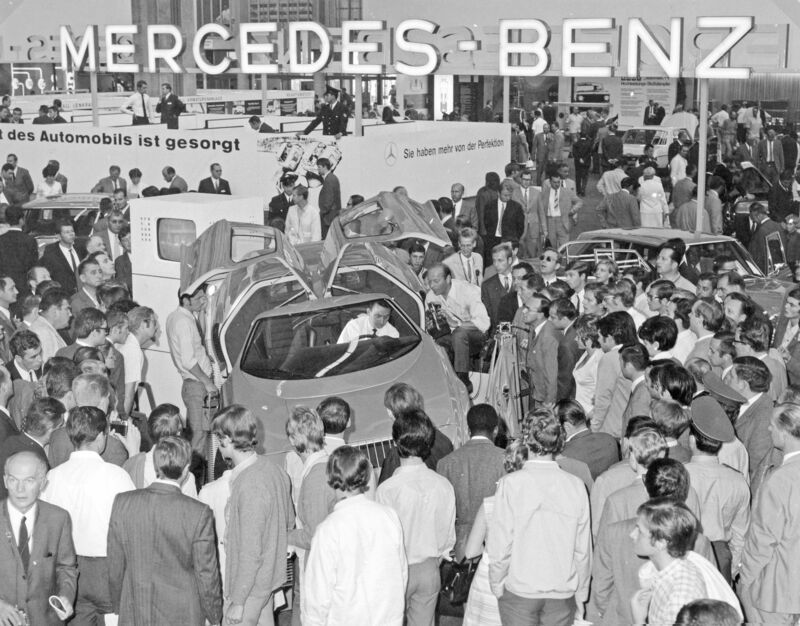 Yet when crowds gathered at the carmaker’s booth at Frankfurt in September 1969, it was hard to miss the C111 experimental car or the way it evoked the company’s former approach to advanced engineering. Half a century later, the company has planned an even more impressive display featuring the same rotary-powered car and its multiple descendants. The C111 came about, as Karl Ludvigsen wrote for a two-part series in Hemmings Sports & Exotic Car #3 and #4, due to two lines of exploration in Sindelfingen. The first dated back to October 1961, when Mercedes-Benz licensed a patent for the Wankel rotary engine. The company did so not because it had any particular use in mind for the rotary, Ludvigsen wrote, but because it figured it would at some point in the future. Under Wolf-Dieter Bensinger, Mercedes-Benz designed its own take on the rotary, but couldn’t wring any more than 220 horsepower out of it, hardly enough to adequately motivate the company’s growing sedans. 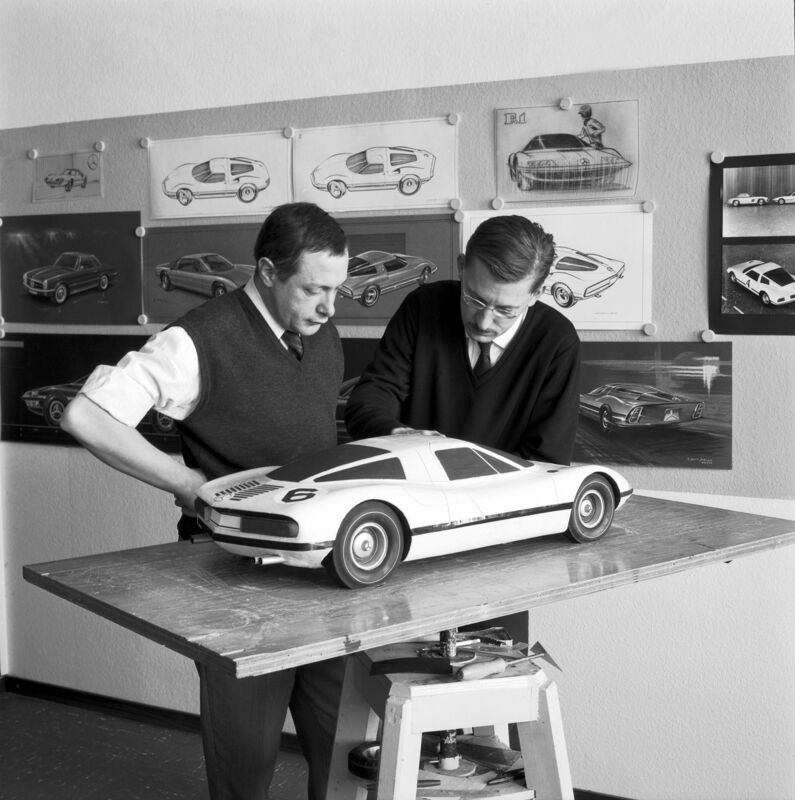 The Mercedes-Benz designers Giovanni Battistella (left) and Paul Bracq next to a 1:5 design model of the super sports car study SLX, 1965, and a 1:5 design model of the super sports car study SLX in the wind tunnel, 1966. Rudolf Uhlenhaut, however, noted that the power output was adequate for the smaller mid-engine sports cars that he and his team were investigating. 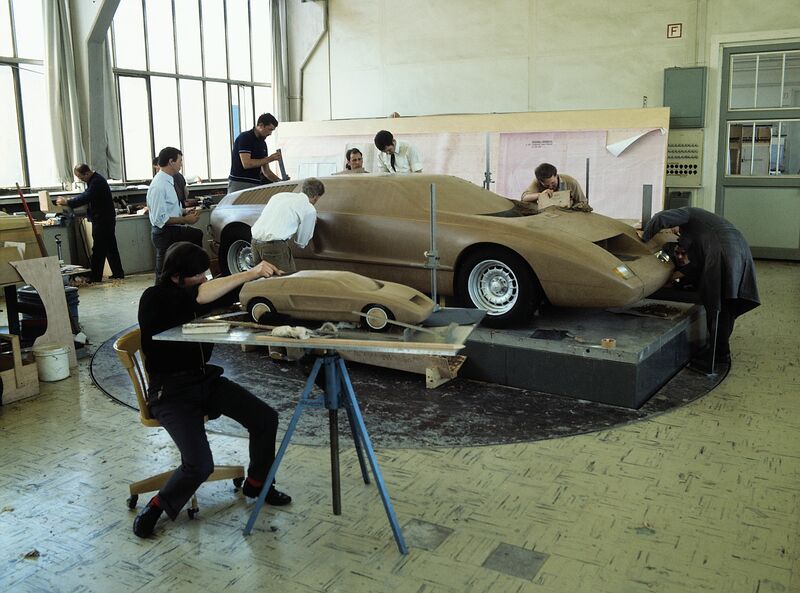 Inspired in part by the SL-X, Giorgio Battistella and Paul Bracq’s 1965 mid-engine coupe design study, which made it as far as the wind tunnel, development work began on a mid-engine coupe project – code named C101 – under engineer Hans Liebold in November 1968. Designed around the driver, a fuel-injected 5.4-liter KE-series three-rotor engine, and a ZF five-speed transaxle, the C101 would use a platform frame with an integrated roll bar and fuel tanks in each of the side sills. Brakes and steering would come from the production Mercedes-Benz sedans, and the engineers employed computer programs to help plot linkage for the car’s rear suspension. From the outset, the bodies were designed to use gullwing doors; even the “Tin Box” mule that Liebold’s team whipped up to test the overall package featured the doors. In another experiment for Mercedes-Benz, the C101 featured a fiberglass body that engineers Werner Breitschwerdt and Karl Wilfert designed to minimize both drag and lift sans flaps or spoilers. Fiberglass truck body manufacturer Rastätter Waggonfabrik handled body construction for the engineers and in July 1969 the first C101 rolled out of the development works for testing. 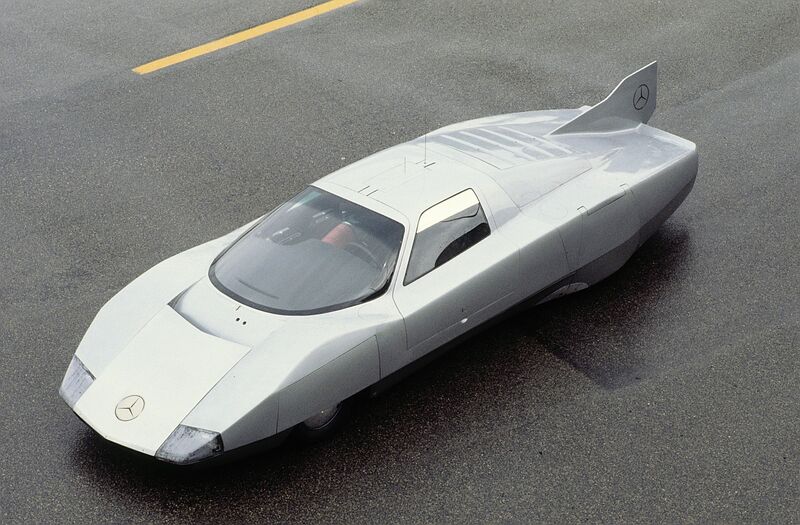 Mercedes-Benz C 111-II experimental vehicle with a four-rotor Wankel engine,1970. From left: Mercedes-Benz C 111-II experimental vehicle with a four-rotor Wankel engine. 1:1 scale model for design approval. 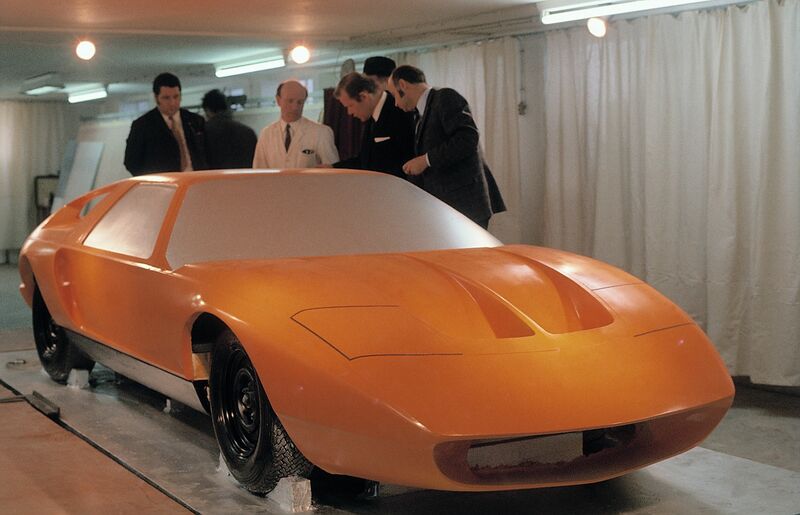 The Mercedes-Benz design team for the C 111 headed by Josef Gallitzendörfer (next to the vehicle) developing the shape for the first variant of the experimental vehicle in 1969. 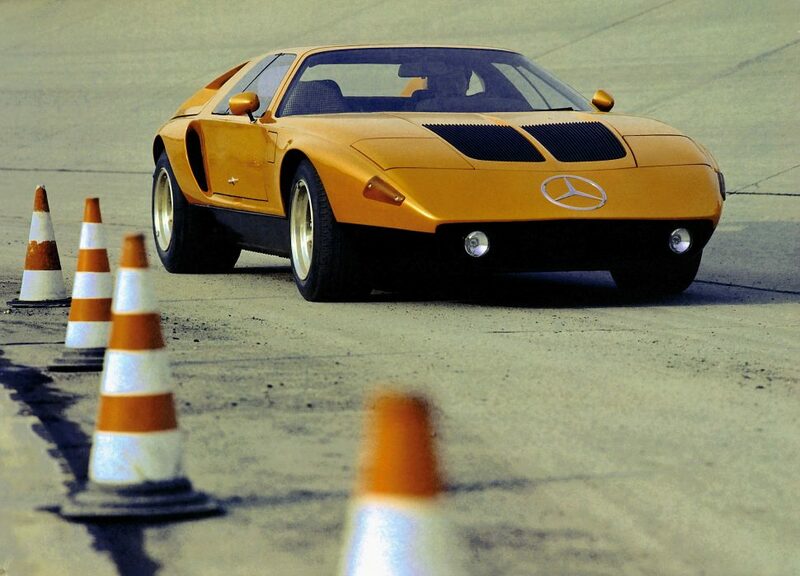 Mercedes-Benz C 111 experimental vehicle (1969) together with three Mercedes-Benz series production vehicles in the steep curve on the test track at the Mercedes-Benz Untertürkheim plant. Mercedes-Benz C 111 experimental vehicle (1969).The spectacular vehicle was in the limelight at the International Motor Show IAA in Frankfurt in September 1969. The C101 code name wouldn’t make it to Frankfurt for the same reason Porsche couldn’t call its 356 successor the 901: Peugeot had a trademark on three-letter type designations with 0 in the middle. 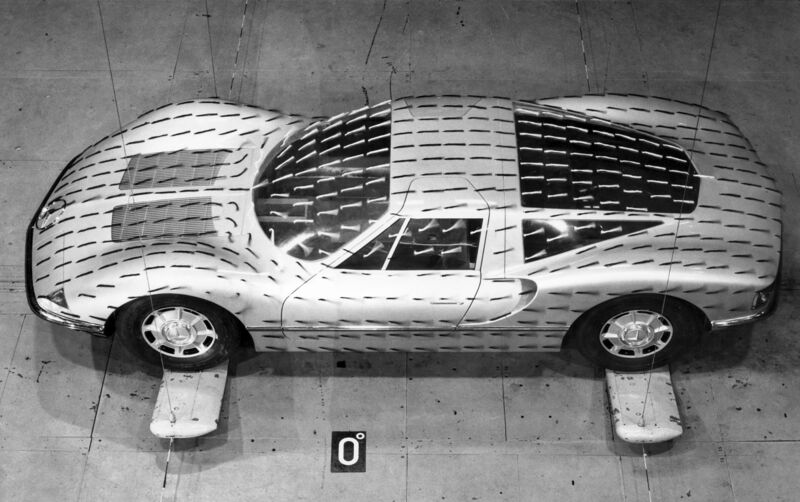 So instead, Mercedes followed Porsche’s lead and renamed the wedge-shaped “rolling test laboratory” the C111 for the Frankfurt show. In addition to the new name, the C111 also featured a 330hp tuned version of the three-rotor engine that was theoretically good for 165 MPH. Good, but not good enough, apparently. Liebold’s team, intent to improve on the C111, began work on the C111-II, a four-rotor successor that debuted in March 1970 in Geneva. 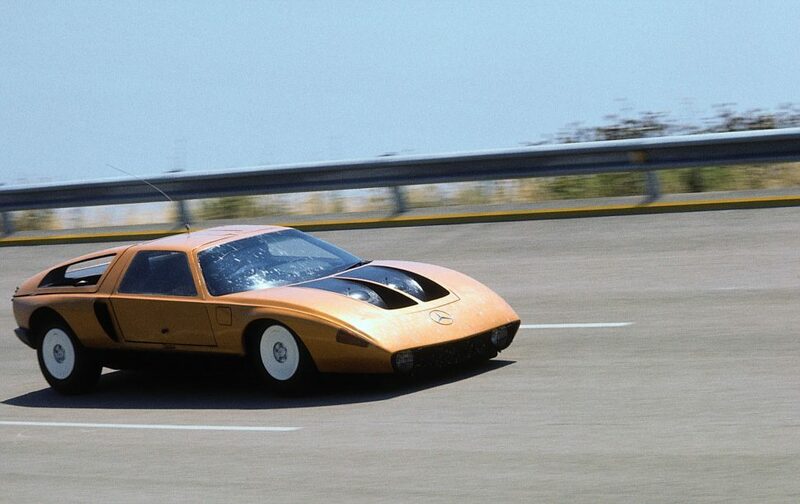 In addition to the larger 7.2-liter engine reportedly good for 400-plus horsepower, the C111-II featured chassis refinements (including a five-inch stretch in wheelbase to accommodate the longer engine) and a completely restyled body with a better drag coefficient and better rear visibility. All those improvements added up to a boost in top speed to 188 MPH. Mercedes, meanwhile, had difficulty expressing the C111’s exact role. 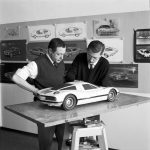 The company didn’t see the cars as attention-getting one-off showpieces: According to Ludvigsen, the company authorized Liebold’s team to build 13 total C111s and C111-IIs. Nor did the company appear willing to develop a rotary-engined fiberglass gullwing sports coupe for production. “At one and the same time, the rotary engine remained the C111’s most attractive feature and spoke most strongly against its production,” Ludvigsen wrote. “When a proposal for C111 production was put to a vote in the Daimler-Benz management board, it was rejected by a narrow margin.” It likely didn’t help matters much that Uhlenhaut, one of the champions of the project, faced retirement within a couple of years. 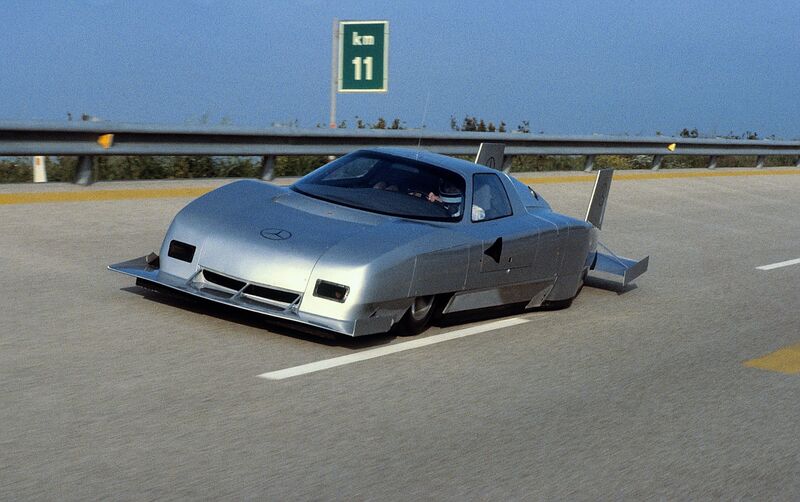 Mercedes-Benz C 111-II D record-holding car during the record-breaking drive in Nardò, June 1976. Externally the vehicle only differs from the C 111-II in certain details, such as the omission of the outside mirrors and folding headlamps. Which is not to say the C111 project died out completely after 1970. Instead, six years later, in an attempt to generate publicity for the company’s new 3.0-liter line of five-cylinder diesels, Mercedes-Benz grabbed a C111-II (according to Ludvigsen, the Geneva show car), fit it with a 190hp turbocharged and intercooled version of the diesel, and took it to Nardo, where it set 16 records – some of them previously set by Ab Jenkins at Bonneville – over a 64-hour period. The C111-IID, as the record-breaking car was renamed, helped pave the way for the soon-to-be-ubiquitous OM 617 turbodiesel. It also led to a second record-setting attempt in 1978 with the C111-III, another variant of the mid-engine gullwing coupe, still sporting the turbodiesel, though now lengthened, streamlined, and looking like it would end up on the set of Battlestar Galactica after its record run. One of the two C111-IIIs blew a tire and destroyed the rear bodywork during its record run, but the backup car completed the attempt and set nine records. 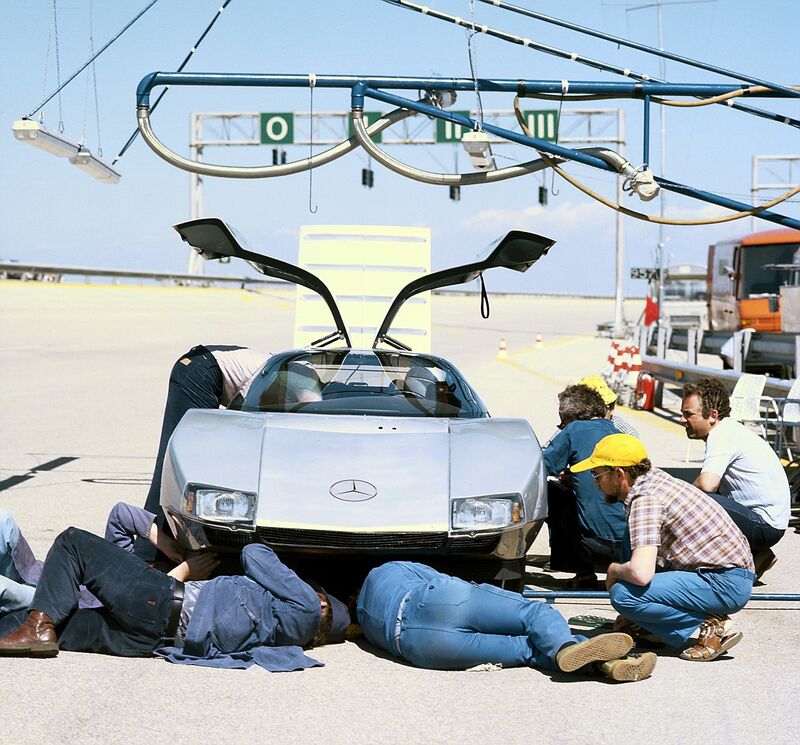 From left: Mercedes-Benz C 111-III record-breaking vehicle (1978), taken on the test track at the Mercedes-Benz Untertürkheim plant. 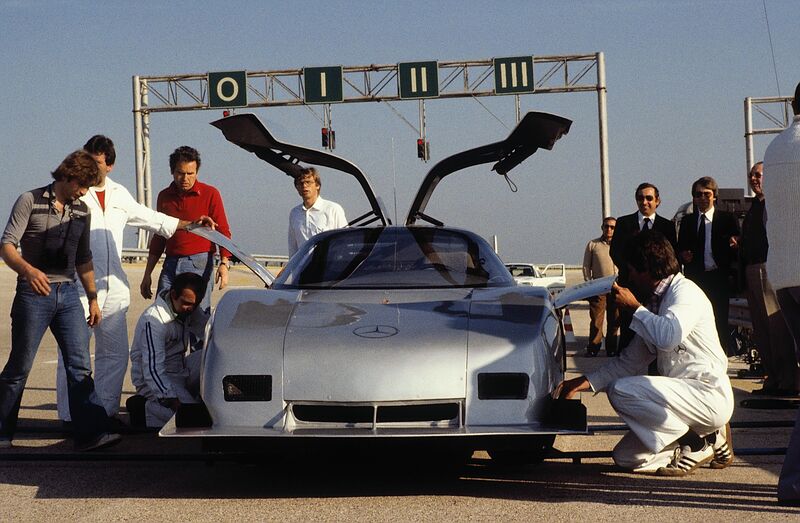 Mercedes-Benz C 111-III record-holding car during the record-breaking drive in Nardò, April 1978. 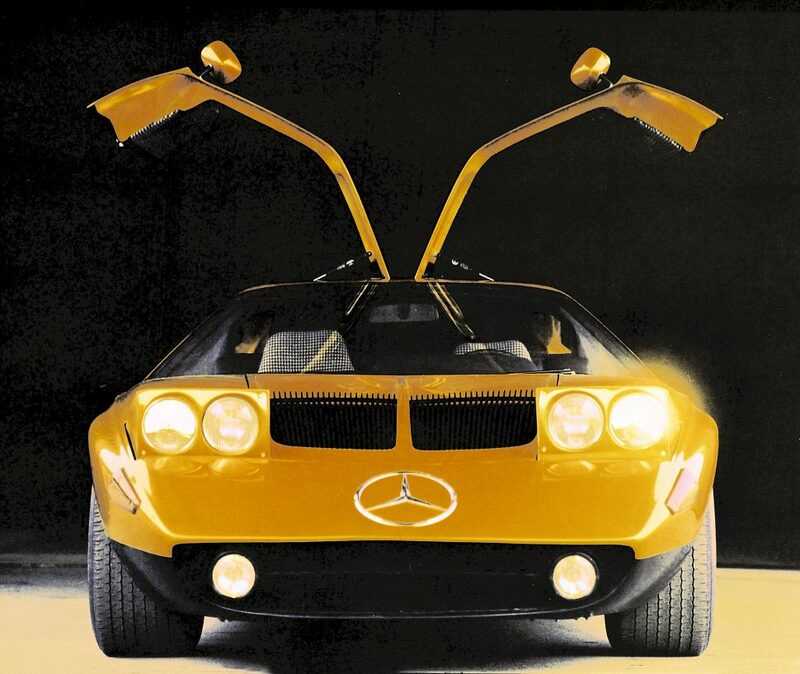 A year later, Mercedes-Benz decided to go after one more record and put together the C111-IV, a C111-III repowered with a 4.8-liter version of the contemporary SL’s 4.5-liter V-8. Its revised bodywork sported tailfins and spoilers aplenty, and in May 1979 it set the world circuit speed record at 403.978 KPH (about 251 MPH). According to Mercedes-Benz Classic, one of each of the five generations of C111 will appear on the company’s stand at the upcoming Techno Classica Essen show, joined by the SL-X design study, as part of a celebration of the first C111’s 50th anniversary. Techno Classica Essen takes place April 10-14. For more information, visit SIHA.de.